There are plenty of activities here to suit all ages, starting with the Little Chiefs Kids club one of the most popular along the coast. There's plenty of indoor and outdoor space to entertain their littlest guests and most of the activities take place at the children's pool or beach so you can be sure they're enjoying the great outdoors. Older kids can take part in a resort bike tour, pool games or beach volleyball, if that's not enough there's plenty of water activities available both motorised and non-motorised that is if you can tear them away from the resorts own water park including slide, monkey bars and action tower. * Return Flights. 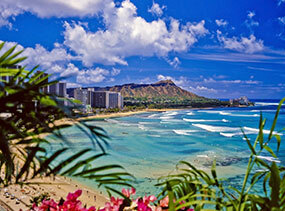 Includes 23kg luggage allowance, meals, drinks and all airfare taxes. 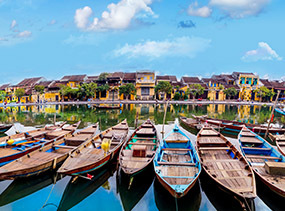 Advertised price valid for travel 1 - 30 Nov 19 & 01 Feb - 31 Mar 20, add from $200pp for 01 Aug – 14 Sep 19, subject to availability. Limited seats are available on some departure dates. Prices shown are a guide only, based on low season availability & some conditions. Please contact one of our Holiday Champions for an exact quote on the dates you wish to travel & any conditions that may apply. Ever dreamed about jetting off to your own tropical island for a holiday filled with pampering, deluxe accommodation and breathtaking views? Then you should probably head along to Shangri-La's Fijian Resort and Spa, pronto. World-famous for its natural golden sand beaches, three swimming pools and exclusive location, Shangri-La's is not to be missed. Located on the Coral Coast's Yanuca Island, you'll feel miles away from the hustle and bustle of the real world, with easy access to the mainland should you feel inspired to venture outside the resort's grounds. The resort has everything you could dream of in a Fijian holiday - soft, sandy beaches, intense emerald waters and colourful coral reef filled with aquatic life. There's no wonder it's one of the most popular destinations in Fiji, and the village-inspired layout has guests feeling at home immediately. For those who can't resist a bit of a work out on their holiday, you'll love the on-site Golf and Gym Bure with aerobic stations and free weights. It's air conditioned and perched on the edge of the Pacific Ocean, so you may even forget you're exercising! Swing a club around at the nine-hole Executive Golf Course, designed exclusively for Shangri-La's by Peter Thompson, a British Golf Open winner. After a hard day on the green, relax in an ambient, beautifully-decorated room furnished with a Fijian inspiration. You get your own private balcony with unparalleled views of the Pacific Ocean, which is perfect to unwind on with a cool drink or two. If you're bringing your tiny terrors along, drop them off at the Little Chief's Club for activities to keep them entertained all day long. Sneak off and enjoy some time to yourself, or relax poolside with the little ones as you soak up some of that famous Fijian sun. 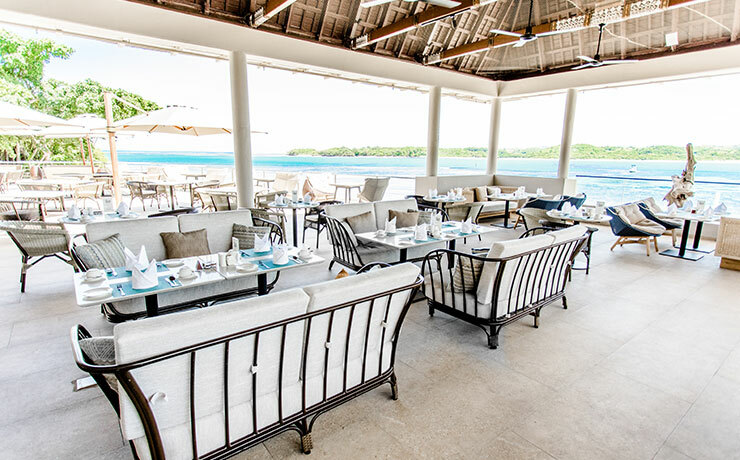 Set on a private island and surrounded by white sand beaches, this large resort is only a 45 minute drive from Nadi and connected to the mainland by a causeway from the beautiful Coral Coast of Fiji's main island Viti Levu. Shangri-La's signature Chi Spa has four ocean view and two rainforest bures treatment bures (villas) located within the Chi Spa Village. The Spa menu is based on traditional Chinese and Himalayan treatments, and also offers locally inspired treatments. The Chi Spa is an ideal retreat for adults looking for the ultimate in holiday relaxation. 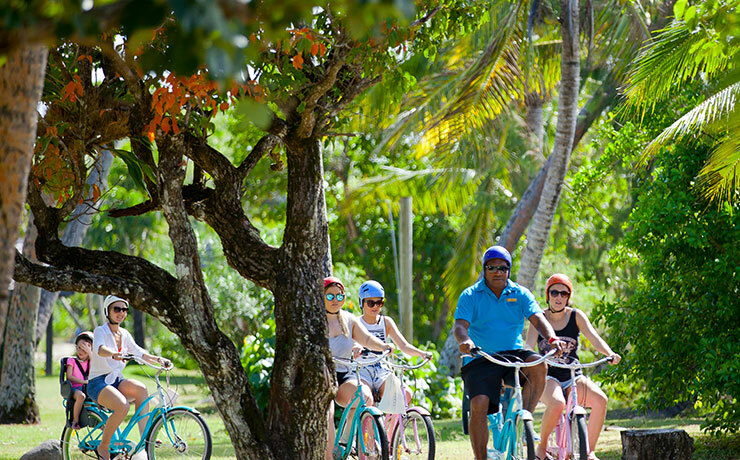 Complimentary Activities include: non-motorised sports including tennis, windsurfing, canoeing, sailing, kayaking, snorkelling equipment excluding mask (for 2 hours) & renowned Kids Club. Activities with cost: Coral viewing boards, horse riding, tennis, golf, scuba diving, game fishing. Ideal for families and groups travelling together, the Lagoon Family Rooms are mostly located on ground floors with easy access to the resort's most popular areas. Baby cots can only be placed in Ocean View, Lagoon Family, Ocean Family, 1 Bedroom Suite and 2 Bedroom Beach Bure. The cots are available at no charge. An infant is included in the children count for maximum room capacity. The resort caters superbly for children and they'll love spending time at the legendary 'Little Chiefs Club' with activities to keep them entertained all day. The club is FREE for all children between the ages of 4 and 11 years, and is open everyday from 9am to 12noon and then again from 1pm to 5pm. While the activity programs are designed for 4 to 6 years and 7 to 11 year olds all children under 4 year require a babysitter. Kids club staff supervise children's activities including drawing, face painting, fish feeding, crab races, crab hunts, frog races, frog hunts, Fijian Meke dance lessons, spear throwing, swimming races, story telling and much more. Kids under 18 years stay free (when sharing room with adults), kids under 12 years eat free buffet meals when accompanied by paying adult (max.2 kids per room). The resort prides itself on providing a selection of dining options, whatever the mood or the occasion. There are 5 restaurants offering a-la-carte, barbeque, Asian seafood or an international themed buffet every evening. - Kalevu (for fine dining), Takali (Asian influenced), Lagoon (Mediterranean influenced), Golden Cowrie (Pacific Rim), Beach Bar & Grill (snacks). With six bars on site, you'll be sure to enjoy those cooling lunchtime drinks and pre dinner cocktails and with an array of tempting cuisine on offer, the resort has something for all tastes and budgets. Whether on the beach or by the pool, a refreshing cocktail, cooling drink or light snack is never far away. Stop at he Bilo Bar, the ideal venue for sunset drinks, then head to the Black Marlin bar and enjoy the invigorating beats from a resident band or disco every night. Experience Fiji and Pacific Island culture at the Marau Village. Enjoy a traditional lovo (a traditional way of preparing food in an underground earth oven) Meke (song and dance performance) and fire walking featuring the famous Beqa Island Fire walkers. On selective nights you can experience the Shangri-La's Fijian fire dancers. With over 400 rooms the Shangri-La resort is the largest on the Coral Coast. All rooms face out towards the ocean or lagoon and offer modern decor with a touch of Fijian elegance. With plenty of accommodation choices the resort has something from all tastes and budgets Take your choice of lagoon or ocean view or if travelling with families there's different styles of family rooms and suites. The guest rooms are within the hotel's 5 main wings, each with its own private balcony and all offer stunning ocean or lagoon views. Each guest room and bure features air-conditioning, ceiling fans, IDD telephone, in-room safe, refrigerator, tea/coffee making facilities, toiletries, hairdryer, bath robes, iron and ironing board and private balcony. Televisions feature in all rooms. Superior Lagoon View rooms offer contemporary accommodation with traditional Fijian touches inspired by natural elements. Located in the Lagoon Wing near the Lagoon Pool, the room offers a private balcony with views of the tropical lagoon. Superior Lagoon View Ground Floor rooms are available at an extra charge and provide easy ground level access. Ideal for families with young children or elderly guests. Superior Lagoon Family these rooms are slightly larger than the Superior Lagoon View and Superior Lagoon Ground floor and consist of a king and 2 single beds and have a shower only, they can be located on either the ground, 1st or 2nd floors of the Lagoon wing. Superior Ocean View rooms are ideal for families or couples in a quieter corner of the resort. Located in the Ocean Wing close to the Coral Pool, Cafe Coral and Golf & Gym Bure. Ideal for families and groups travelling together. Deluxe Ocean Family Room are perfect for those larger families of 2 adults and 3 children. Located on the ground floor these rooms are larger (43sqm) and consist of a king and 2 divan beds in an L shape with room for a rollaway for the 3rd child. The bathroom also features a separate bath and shower perfect for the little ones to take a bath. The rooms are close to the infinity pool located at the coral wing, but there is a distance to the little chiefs club and children’s buffet. 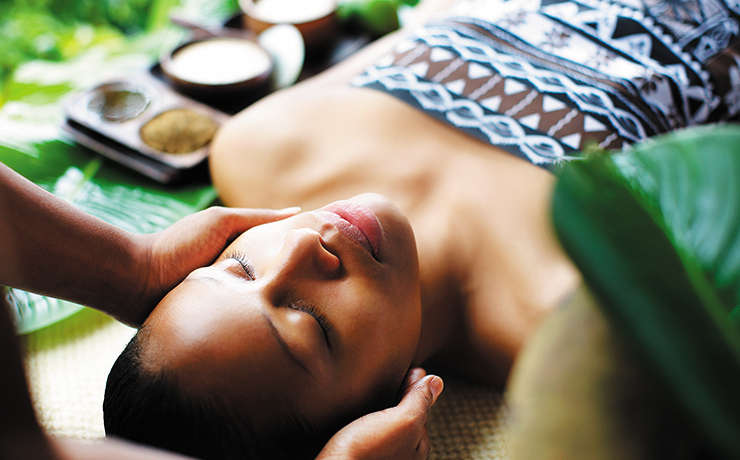 Receive chocolates, a bottle of sparkling wine and a 'Bride & Groom' 30 minute massage each with compliments of Shangri-La's Fijian Resort & Spa. Note: Minimum stay 5 nights. Must be stated that couple are honeymooners at the time of booking. For those who want to get married in paradise, there can be no better spot than the Shangri-La's Fijian Resort. 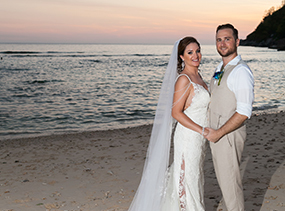 The resort's beautiful island offers a range of stunning venues for outdoor weddings as well as a non denominational Seaside Wedding Chapel. Set amidst a plantation of palm trees at the waters edge, the Seaside Chapel is located in an intimate and secluded setting near the 7th golf green. The chapel seats up to 40 guests. 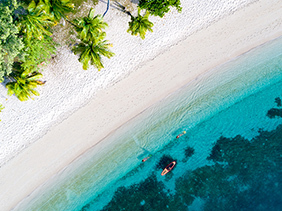 Shangri-La's Fijian Resort & Spa Ever dreamed about jetting off to your own tropical island for a holiday filled with pampering, deluxe accommodation and breathtaking views? Then you should probably head along to Shangri-La's Fijian Resort and Spa, pronto. World-famous for its natural golden sand beaches, three swimming pools and exclusive location, Shangri-La's is not to be missed. Located on the Coral Coast's Yanuca Island, you'll feel miles away from the hustle and bustle of the real world, with easy access to the mainland should you feel inspired to venture outside the resort's grounds. The resort has everything you could dream of in a Fijian holiday - soft, sandy beaches, intense emerald waters and colourful coral reef filled with aquatic life. There's no wonder it's one of the most popular destinations in Fiji, and the village-inspired layout has guests feeling at home immediately. 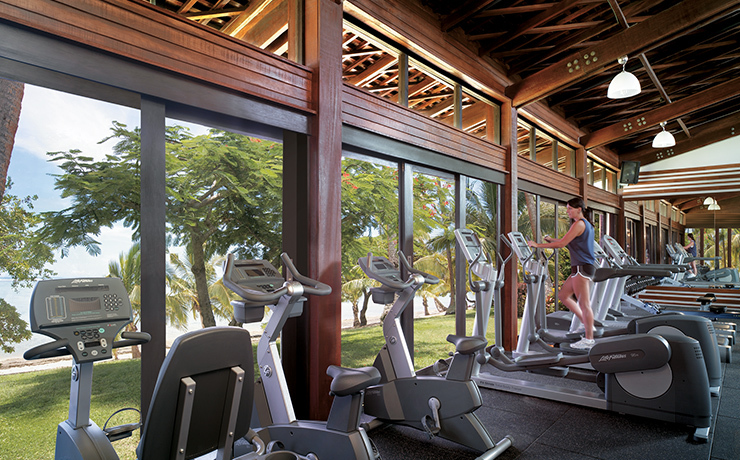 For those who can't resist a bit of a work out on their holiday, you'll love the on-site Golf and Gym Bure with aerobic stations and free weights. It's air conditioned and perched on the edge of the Pacific Ocean, so you may even forget you're exercising! Swing a club around at the nine-hole Executive Golf Course, designed exclusively for Shangri-La's by Peter Thompson, a British Golf Open winner. After a hard day on the green, relax in an ambient, beautifully-decorated room furnished with a Fijian inspiration. You get your own private balcony with unparalleled views of the Pacific Ocean, which is perfect to unwind on with a cool drink or two. If you're bringing your tiny terrors along, drop them off at the Little Chief's Club for activities to keep them entertained all day long. Sneak off and enjoy some time to yourself, or relax poolside with the little ones as you soak up some of that famous Fijian sun. 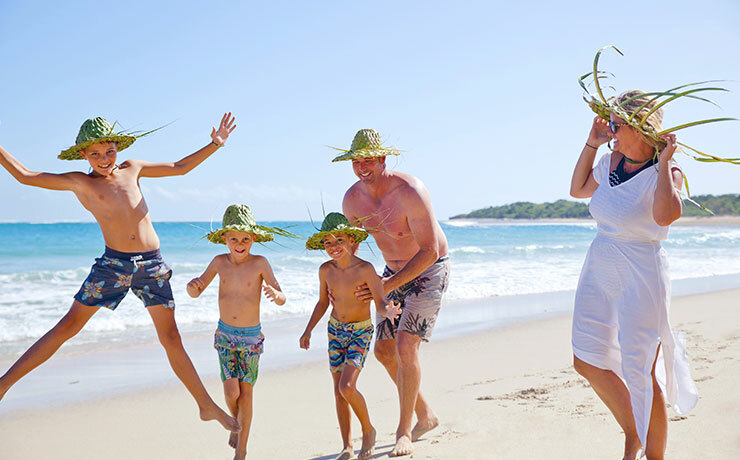 Back to Top Location Set on a private island and surrounded by white sand beaches, this large resort is only a 45 minute drive from Nadi and connected to the mainland by a causeway from the beautiful Coral Coast of Fiji's main island Viti Levu. Back to Top Facilities The Shangri-La's Fijian Resort & Spa offers a wealth of choices for the entire family. With Three freshwater swimming pools, a Peter Thompson designed 9-hole executive golf course, two tennis courts (floodlit), gymnasium and a comprehensive sea sports centre offering anything and everything from snorkelling equipment to deep sea fishing excurions and PADI course Shangri-La's signature Chi Spa has four ocean view and two rainforest bures treatment bures (villas) located within the Chi Spa Village. The Spa menu is based on traditional Chinese and Himalayan treatments, and also offers locally inspired treatments. The Chi Spa is an ideal retreat for adults looking for the ultimate in holiday relaxation. 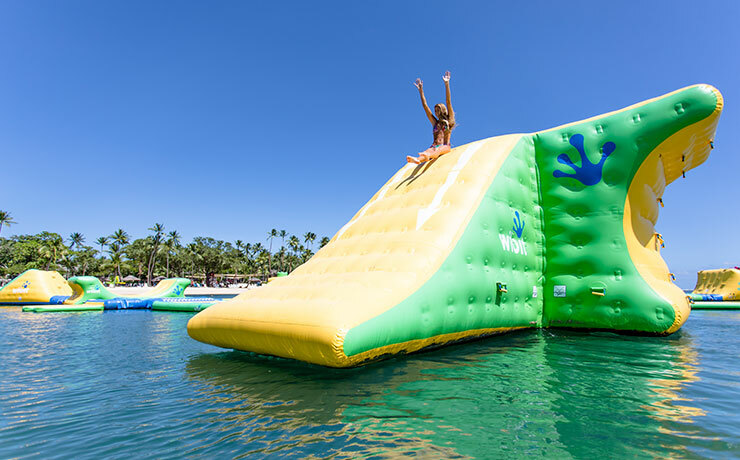 Complimentary Activities include: non-motorised sports including tennis, windsurfing, canoeing, sailing, kayaking, snorkelling equipment excluding mask (for 2 hours) & renowned Kids Club. Activities with cost: Coral viewing boards, horse riding, tennis, golf, scuba diving, game fishing. 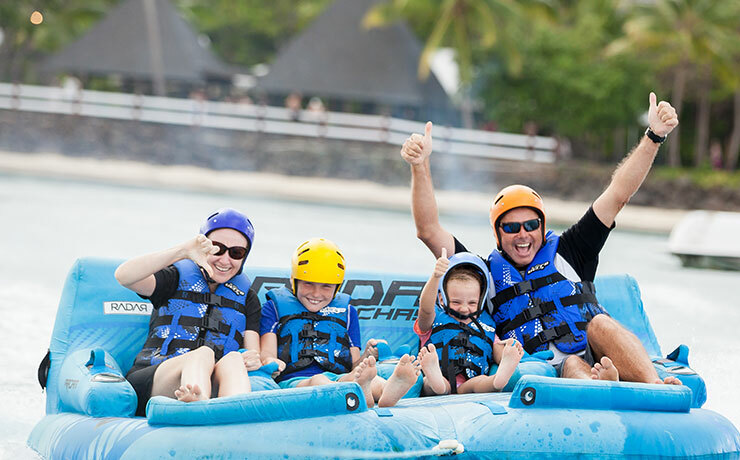 Back to Top Family Deals Ideal for families and groups travelling together, the Lagoon Family Rooms are mostly located on ground floors with easy access to the resort's most popular areas. Baby cots can only be placed in Ocean View, Lagoon Family, Ocean Family, 1 Bedroom Suite and 2 Bedroom Beach Bure. The cots are available at no charge. An infant is included in the children count for maximum room capacity. The resort caters superbly for children and they'll love spending time at the legendary 'Little Chiefs Club' with activities to keep them entertained all day. The club is FREE for all children between the ages of 4 and 11 years, and is open everyday from 9am to 12noon and then again from 1pm to 5pm. While the activity programs are designed for 4 to 6 years and 7 to 11 year olds all children under 4 year require a babysitter. Kids club staff supervise children's activities including drawing, face painting, fish feeding, crab races, crab hunts, frog races, frog hunts, Fijian Meke dance lessons, spear throwing, swimming races, story telling and much more. Kids under 18 years stay free (when sharing room with adults), kids under 12 years eat free buffet meals when accompanied by paying adult (max.2 kids per room). Back to Top Dining The resort prides itself on providing a selection of dining options, whatever the mood or the occasion. There are 5 restaurants offering a-la-carte, barbeque, Asian seafood or an international themed buffet every evening. - Kalevu (for fine dining), Takali (Asian influenced), Lagoon (Mediterranean influenced), Golden Cowrie (Pacific Rim), Beach Bar & Grill (snacks). 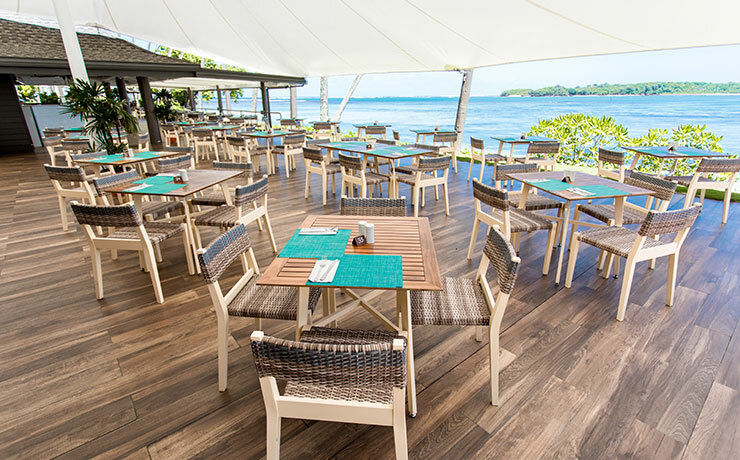 With six bars on site, you'll be sure to enjoy those cooling lunchtime drinks and pre dinner cocktails and with an array of tempting cuisine on offer, the resort has something for all tastes and budgets. Back to Top Entertainment Whether on the beach or by the pool, a refreshing cocktail, cooling drink or light snack is never far away. Stop at he Bilo Bar, the ideal venue for sunset drinks, then head to the Black Marlin bar and enjoy the invigorating beats from a resident band or disco every night. 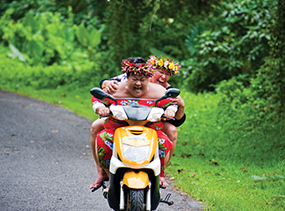 Experience Fiji and Pacific Island culture at the Marau Village. Enjoy a traditional lovo (a traditional way of preparing food in an underground earth oven) Meke (song and dance performance) and fire walking featuring the famous Beqa Island Fire walkers. On selective nights you can experience the Shangri-La's Fijian fire dancers. Back to Top Room Facilities With over 400 rooms the Shangri-La resort is the largest on the Coral Coast. All rooms face out towards the ocean or lagoon and offer modern decor with a touch of Fijian elegance. With plenty of accommodation choices the resort has something from all tastes and budgets Take your choice of lagoon or ocean view or if travelling with families there's different styles of family rooms and suites. The guest rooms are within the hotel's 5 main wings, each with its own private balcony and all offer stunning ocean or lagoon views. Each guest room and bure features air-conditioning, ceiling fans, IDD telephone, in-room safe, refrigerator, tea/coffee making facilities, toiletries, hairdryer, bath robes, iron and ironing board and private balcony. Televisions feature in all rooms. 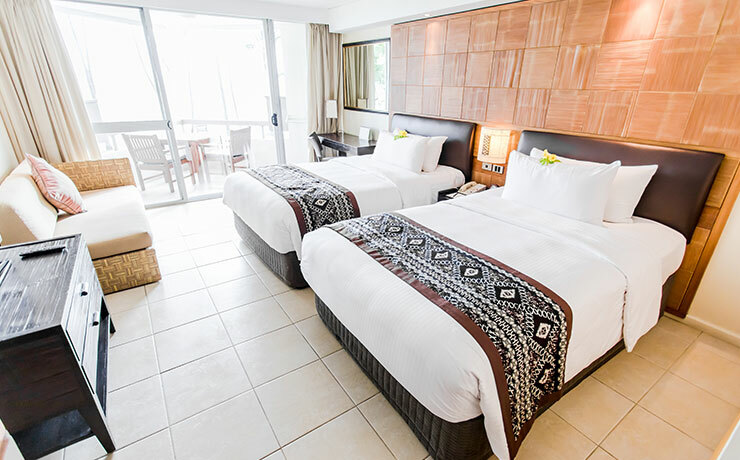 Superior Lagoon View rooms offer contemporary accommodation with traditional Fijian touches inspired by natural elements. Located in the Lagoon Wing near the Lagoon Pool, the room offers a private balcony with views of the tropical lagoon. Superior Lagoon View Ground Floor rooms are available at an extra charge and provide easy ground level access. Ideal for families with young children or elderly guests. Superior Lagoon Family these rooms are slightly larger than the Superior Lagoon View and Superior Lagoon Ground floor and consist of a king and 2 single beds and have a shower only, they can be located on either the ground, 1st or 2nd floors of the Lagoon wing. Superior Ocean View rooms are ideal for families or couples in a quieter corner of the resort. Located in the Ocean Wing close to the Coral Pool, Cafe Coral and Golf & Gym Bure. Ideal for families and groups travelling together. Deluxe Ocean Family Room are perfect for those larger families of 2 adults and 3 children. Located on the ground floor these rooms are larger (43sqm) and consist of a king and 2 divan beds in an L shape with room for a rollaway for the 3rd child. The bathroom also features a separate bath and shower perfect for the little ones to take a bath. The rooms are close to the infinity pool located at the coral wing, but there is a distance to the little chiefs club and children’s buffet. For those looking for a little more space there's the Executive Suite with spate bedroom and living area For the ultimate in luxury there's the Premier Lagoon Bure and Premier Ocean Back to Top Honeymoons & Weddings HONEYMOONERS Receive chocolates, a bottle of sparkling wine and a 'Bride & Groom' 30 minute massage each with compliments of Shangri-La's Fijian Resort & Spa. Note: Minimum stay 5 nights. Must be stated that couple are honeymooners at the time of booking. 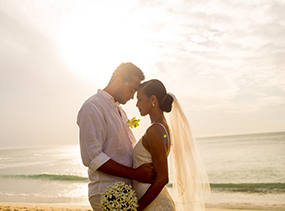 WEDDINGS For those who want to get married in paradise, there can be no better spot than the Shangri-La's Fijian Resort. The resort's beautiful island offers a range of stunning venues for outdoor weddings as well as a non denominational Seaside Wedding Chapel. Set amidst a plantation of palm trees at the waters edge, the Seaside Chapel is located in an intimate and secluded setting near the 7th golf green. The chapel seats up to 40 guests. 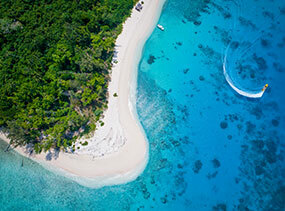 No matter what time of the year it is, it's always a good time to head to Fiji's Coral Coast. The island getaway is as perfect for a romantic retreat as it is for an action-packed family holiday, so there's no reason why you shouldn't be packing your bags and heading here pronto! When it comes to planning your accommodation on this palm tree-lined coast, the options are endless. 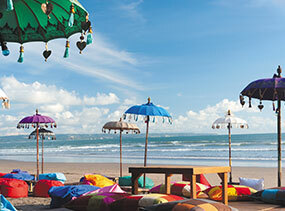 Feel like a large resort with kids' activities and in-house restaurants? No worries. How about an intimate boutique villa with top-notch customer service and ocean views? Of course! Coral Coast really does have it all, and it's just waiting to be discovered by you. 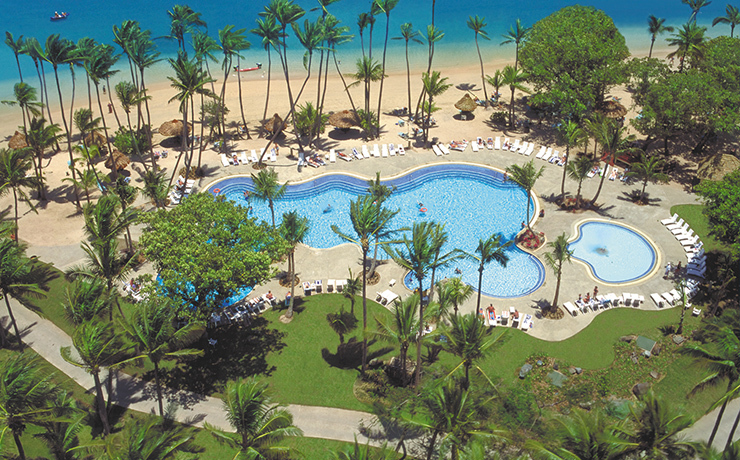 Sporty holidaymakers will love the InterContinental Fiji Golf Resort and Spa, which features a serene ambiance provided by its white sand beach and rolling surf. Once you tire of the aquatic activities, pop on your argyle vest and head out to the resort's own 18 hole championship golf course. You'll feel like Tiger Woods in no time (minus the indiscretions, of course). Those looking for a luxury retreat should consider Outrigger on the Lagoon, which is the first official 5-star rated resort in Fiji. One night in your room and you'll understand why - it truly feels like paradise here. The resort is set amongst a 40 acre tropical garden and panoramic ocean views, giving holidaymakers the best of both worlds. With its range of activities, facilities and on-site dining options, you could spend your entire holiday on resort grounds - and with one of the largest swimming pools in the South Pacific, why wouldn't you? No matter what you're looking for in your Coral Coast holiday experience, we can help make your dreams come true. Trust us, you're going to love your next holiday. 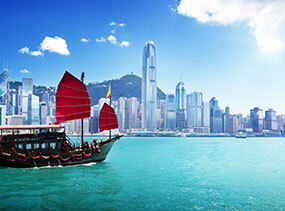 Prices shown are a guide only based on 2 adults travelling, please contact one of our Holiday Champions for an exact quote on the dates you wish to travel and any conditions that may apply. Prices are per adult and include airfares, all taxes, transfers & twin share accommodation (maximum 2 children per room). Hotel specials have varied travel dates, block-out dates & high season surcharges may apply, especially during school holidays. Prices are also subject to change without notice due to currency, tax fluctuations & fuel surcharges.